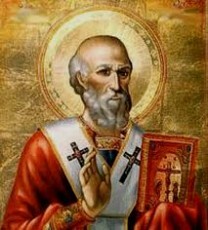 St. Athanasius of Alexandria was born in Greece around 296. He was the 20th Bishop of Alexandria, and his Episcopate lasted 45 years from June 8, 328 to May 2, 373. Over 17 years of his being Bishop was spent in five exiles, ordered by four different Roman Emperors. He is a venerated as a renowned Theologian, a Church Father, and a noted Egyptian leader of the fourth century. He is also remembered for his role in the conflict with Arius and Arianism. In 325, at the age of 27, he had a leading role against the Arians in the First Council of Nicaea. He was a deacon and personal secretary of the 19th Bishop of Alexandria. At the age of 30, he became the Archbishop of Alexandria. He continued to lead the conflict against the Arians for the rest of his life, and was engaged in theological and political struggles against the Emperors Constantine the Great and Constantius II. Many called him a “Pillar of the Church”. His writings show his strong desire to the Word-become-man, his great pastoral concerns, and his profound interest in Monasticism. He is counted as on of the four great Eastern Doctors of the Church, and is labeled the “Father of Orthodoxy”. Western Christianity venerates his feast day as May 2nd, while the Coptic Orthodox Church celebrates his feast on May 15th. Athanasius was not a speculative theologian. Many letters exist today, “First Letters to Serapion”, that show he held on to the tradition, teaching, and faith proclaimed by the Apostles just a few centuries before, and guarded by the Church Fathers. He held and proclaimed that not only was the Son of God “Consubstantial” with the Father, but so was the Holy Spirit. This belief and holding on to the tradition of the Apostles had a great deal of influence in the development of later doctrines regarding the Trinity. St. Athanasius of Alexandria was born in Greece around 296. He was the 20th Bishop of Alexandria, and his Episcopate lasted 45 years from June 8, 328 to May 2, 373. Over 17 years of his being Bishop was spent in five exiles, ordered by four different Roman Emperors. He is a venerated as a renowned Theologian, a Church Father, and a noted Egyptian leader of the fourth century. He is also remembered for his role in the conflict with Arius and Arianism. He continued to lead the conflict against the Arians for the rest of his life, and was engaged in theological and political struggles against the Emperors Constantine the Great and Constantius II. Many called him a “Pillar of the Church”.